This tract of land is located a short distance from the Curwensville Lake and Recreational Area in an area of rolling hills. It is on one of those hills. There is one area where a great view of the countryside might be selected for a home site. Other than that site are others which would a provide pleasant and secluded home or cabin site. There is one soil test area for an elevated sand mound. There shouldn't be a problem to find other sites according to the location selected for a building site. The tract is within an area once mined and reclaimed. 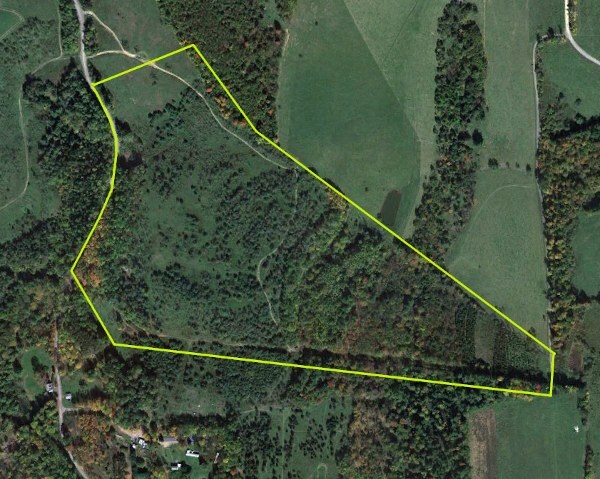 Forested areas are mostly pine and locust but there are maple and cherry and other hardwoods throughout the 55 acres. A power line crosses the tract and would be available to tap into. There appears to be a good population of deer and turkey in the area. The Dam provides fishing, boating water sports near by. Eagles Ridge Public Golf Club is near. For more information about the Curwensville Lake Recreational Area, please click here http://www.visitpa.com/curwensville-lake-recreation-area and http://curwensvillelake.com/ .